Herbie to Headline Wolf Hollow Biergarten! 23 AugHerbie to Headline Wolf Hollow Biergarten! Your Glenville Oktoberfest Committee is thrilled to announce that Herbie is returning in 2016 and will be featured in our new Wolf Hollow Biergarten tent! 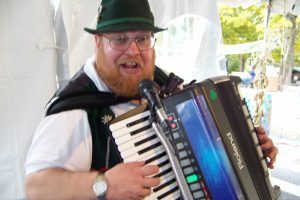 Herb Liebenhagen was one of our featured entertainers in the early years of Glenville Oktoberfest over at the Schenectady Airport and we are thrilled to book him for this year!